1. The wall is gone. Let a thousand souvenirs prevail. What would have been celebrated as a hard won victory by many cultural activists of the sixties, seventies, and early eighties has today been met with an apathetic shrug. The line between high and low art has been discarded by a generation of artists who reveal the same indifference toward this once stalwart barrier that my generation in the eighties displayed toward the problem of “flatness” in painting. What changes have taken root in the wake of this insouciant revolution? What of Mao’s thousand flowers of proletarian culture, Benjamin’s worker turned producer, the decentralized people’s art of the New Left? Not one of these ideas endure. Instead we bear witness to a merchandising pageant where contemporary art merges with designer labels that may soon include: Kline/Flavin, Armani/ Beuys, Madonna/Sherman, and Hugo Boss/Barney. 1Consider Hans Haacke’s use of the Guggenheim Museum as a specific-site for his "real-time" New York City real estate map Shapolsky et. al. of 1971. In Haacke’s work, described in more detail below, the intervention was not "indexical" to the architectural space of the Museum but was nevertheless specifically situated with regard to the Museum’s audience of educated, liberal art spectators; an "institutional frame" if there ever was one Nevertheless within Kwon’s revised history of site specific art, Haacke’s seminal project falls through her conceptual grid out of sight. See Miwon Kwon "One Place After Another: Notes on Site Specificity" October 80 (Spring 1997): 85-110. This rupture between high and low coincides with an ethical and political vacuum in which trans-national capital holds a political and technological monopoly to which visual culture will soon be added. With mass movements from labor to feminism long since missing-inaction in the post-political 90s, the very idea of a dissident counterculture, one that the Left, however confused and at times self- serving still managed to keep afl oat into the early 80s, has vanished. The impulse towards a collective and sustained art of political opposition, one cobbled together out of what Raymond Williams termed resistant and residual cultural forms, is not only missing but in the non-spectacle of its passing one discovers a trail of good intentions leading to the current landscape of cultural affirmation. It should come as no surprise that the new art world order has forged a joint venture with the fashion and tourism industries, with Hollywood and the new information technologies. After weapons manufacturing, the global image of the United States is most clearly defined by entertainment products and services. And yet with “political art” now more than a few seasons out of fashion and the Left unable to offer even a blurred vision of collective political resistance, the dissipation of the fine art tradition must be seen as a vacuous achievement, even a counter-productive one. Granted that from a certain perspective Degas neck-ties and Cézanne covered baseballs are fitting ends to the pretensions of bourgeois high culture. Still, one can not so easily dismiss the often expressed desire to link avant garde art practices with progressive movements, an objective that belongs as much to the history of modern art as it does to the Left. Yet even the legacy of activist art, when not dismissed altogether, is being re-written, its historical contribution reduced to that of a genteel “institutional critique” of the art industry. This process of revision can be seen at work in a recent essay by architectural critic Miwon Kwon in the journal October. Kwon has virtually re-written the history of site-specific art so as to avoid the fundamental impact of activist politics on this important post-1960’s practice. Kwon tells the story this way: beginning in the early 1970’s certain conceptual artists (Daniel Buren, Hans Haacke) expanded upon one notion of site as a literal but idealized space (that of Donald Judd, Carl Andre) by re-defining site to include the context of the art institution itself. One aim of this text will be to provide a modest counter-weight to this kind of revisionism 3This silence extends to the academic Left and the Left press as well. The former has largely retreated into a funhouse of "theory" while the letter, including widely distributed publications like The Nation, prefer writing about "high art." However, for an important overview of the present state of Marxist Art History that is also less pessimistic see Andrew Hemingway, "Marxism and Art History After the Fall of Communism." Art Journal (Vol. 55 No. 2 Summer, 1996): 20-27. by presenting the work of two activist art collectives founded in 1979: Political Art Documentation and Distribution (PAD/D, 1980-1986,) and Group Material (1979-1997.) These “repossessed” activist art histories will then be used to interpret several features of the current art landscape while arguing that such things as the merging of high and low culture and the divided legacy of site-specificity can only be understood in light of an early eighties art activism when the desire of artists and the agenda of the Left appeared to momentarily converge. The importance of this historical fulcrum lies in the way a concern with non-art world politics all but carried away a generation of artists in a movement not seen since the 1930’s. Indeed some were swept as far away as sectarian left politics, while others remained to be absorbed by an ever adaptive culture industry that had by 1987 transformed “political art” into something as innocuous as third generation abstract expressionism. Nevertheless a few practitioners continued to stumble along hoping things would change. Writing as a self- avowed stumbler, let me now make a provisional stab at defining the term activist art. In a catalog essay for a 1984 exhibition entitled Art & Ideology, the critic and activist, Lucy R. Lippard, described activist art as a practice whereby: “…some element of the art takes place in the “outside world,” including some teaching and media practice as well as community and labor organizing, public political work, and organizing within artist’s community.” 4Lucy R. Lippard " Give and Take: Ideology in the Art of Suzanne Lacy and Jerry Kearns" in the catalog for the exhibition: Art & Ideology (New York, The New Museum of Contemporary Art, 1984): 29 For Lippard, who was a co-founder of several important collectives including: the feminist art collective Heresies, Political Art Documentation and Distribution and Women’s Action Coalition. Activist art is the opposite of those aesthetic practices that, however well-intentioned or overtly political in content, remain dependent on the space of the museum for their meaning. Think of Picasso’s Guernica which despite the artist’s personal abhorrence toward fascism and war, is in its first and last instance an oil painting entirely dependent on an institutional frame . To produce activist art is therefore to put one’s political commitment to the test, first through non-institutional forms of cultural distribution and interaction —art for demonstrations and picket lines, mail art, on city walls or on the sides of buses, art in the middle of shopping malls and crowded plazas —and second to use that form of dissemination to speak about social injustices with an audience who presumably has little patience for refined aestheticism but does care about war, inequality, political freedom and protecting the environment. … mass audiences are not only locked-up firmly in the terminal grip of the media, but where the access that the artist has to the actual apparatus of ideological production [mass media] is at very best that of a parasite who mimics and excels in the strategies of the consciousness industry… 5Benjamin H. D. Buchloh "Since Realism there is..." in (Art & Ideology ): 6. What once seemed to be an overstatement now appears prosaic. As if to turn vice into virtue, postmodern theorists have rejected Buchloh’s pessimism about the media. Instead, artists that operate within pop-culture are celebrated, their parasitism treated as subversive. The artist who “excels in the strategies of the consciousness industry” now invokes William Borroughs and Jacques Derrida, claiming to deconstruct the authority of the media, while still relishing its seductive richness. This trumping of Buchloh’s acerbic criticism helped build the glittering runway that artists such as Matthew Barney now parade down, a point I return to in my conclusion. Regardless, rather than define 80s activist art by invoking its myths or myopia, consider the actual alliances sought out —often temporary and sometimes contentious— between socially engaged artists on the one hand and organized Left political movements on the other. A partial list of these collaborative arrangements operating in New York City between 1979 and 1982 includes: Artists for Nuclear Disarmament (AND), Artists Against Nuclear Madness, Artists for Survival, the Deep Dish and Paper Tiger Television collectives, The Women’s Pentagon Action, “the Anti-WW III Show,” Dangerous Works anti-nuclear network, the Children’s Campaign for Nuclear Disarmament, as well as Political Art Documentation/Distribution’s (PAD/D) contribution to the 1981 mass March against the Pentagon. Activist art projects were also made for the prochoice “street fair” entitled Bazaar Conceptions by the feminist art collective, Carnival Knowledge, and a visual spectacle was produced for the International Day of Action on Reproduction Rights by No More Nice Girls and members of PAD/D, while the Madame Binh Graphics Collective organized an art auction to help fund a women’s center in Zimbabwe. 6Sighted in Political Art Documentation/Distribution newsletters: 1st Issue numbers 1 & 3, and Upfront numbers 3 & 4. (PAD/D New York). 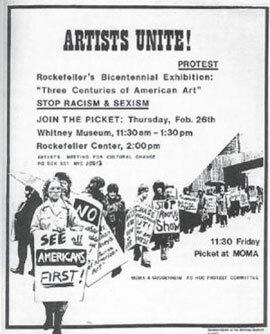 It is important to understand that prior to the late 1970s New York based artist collectives like the Art Workers Coalition (AWC, 1969- to 1971) and Artists Meeting for Cultural Change (AMCC, 1975-1977) had focused their activism primarily toward changing the art world, demanding that museums become responsive to the needs of the contemporary art community as well as take a position against larger social issues such as the Vietnam War. After the 1970s, politically engaged artists aimed to make their practice useful outside the parameters of their own discipline. However the separation between activist art and art merely sympathetic to political dissent is a tenuous one in which historical context defines a position rather than artistic intent. Such was the case with the German born artist Hans Haacke’s project Shapolsky et al. Manhattan Real Estate Holdings, Real-Time Social System. Initially intended for the “idealized” space of the Guggenheim Museum, Shapolsky et al. became a watershed for activists after the work brought about the closing of Haacke’s one person exhibition in 1971. Shapolsky et al. 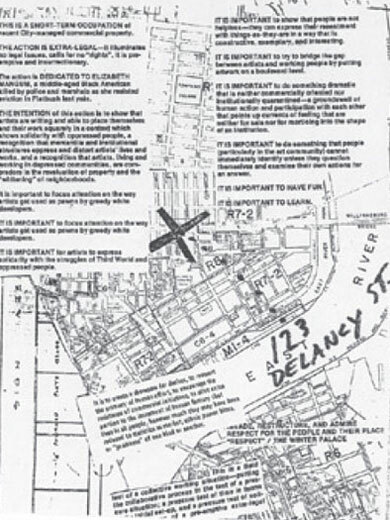 consisted of maps, written descriptions and 142 photographs of New York City real estate holdings owned by landlords Harry Shapolsky and his family. Haacke’s mock-scientific approach offered viewers the facts about something the artist described [at the time] as a “real-time social system,” one that was invisible yet entirely accessible through public records. The artist’s accumulated evidence presented a pattern of social neglect typical of New York’s invidious real estate market. Shapolsky et al. also resembled, if not in fact parodied, the conceptual or information art being made in the early 1970s by artists such as Mel Bochner, Adrian Piper or Joseph Kosuth. After canceling Haacke’s exhibition just prior to the opening Thomas Messer, the museum’s director, summed up his opposition to Shapolsky et al. by stating, “To the degree to which an artist deliberately pursues aims that lie beyond art, his very concentration upon ulterior ends stands in conflict with the intrinsic nature of the work as an end in itself.” 7For a thoroughgoing presentation of Shapolsky et al. see Rosalyn Deutsche "Property Values: Hans Haacke, Real Estate, and the Museum in her book Evictions (Cambridge Mass. MIT Press, 1996): 159. Defining what did lie beyond the art’s “intrinsic nature” was to become the central question for a new generation of activist artists. “we are desperately tired and critical of the drawn-out traditions of formalism, conservatism and pseudo avantgardism that dominate the official art world…. Our project is clear, we invite everyone to question the entire culture we have taken for granted 8Group Material Calendar of Events, 1980-1981, gallery hand-out. “….PAD[/D] can not serve as a means of advancement within the art world structure of museums and galleries. Rather, we have to develop new forms of distribution economy as well as art….” 91st issue. Political Art Documentation/Distribution. (New York: issue no.1, Feb. 1981). Simply put, by the start of the 1980s the only avenue perceived to be open to those who would pursue a politically engaged art was one that led directly out of the museum. Furthermore because the critical framework of early 70s Conceptual Art, Haacke’s included, had laid claim to both the political and the aesthetic radicalism of the early European avant garde, some of these artists who chose to exit the established art world in the early 80s understood this exodus as a logical extension of Berlin Dada and Soviet Productivism. In this sense activist art appeared caught in a paradox between a desire to integrate art practice back into society without regard to the claims of art discourse or history, and a contradictory need to claim the inheritance of the most rigorous modernist art movements of the Twentieth Century. It was not only artists with an explicit political commitment that understood the Guggenheim Museum’s message about acceptable aesthetic boundaries. Beginning in the mid 1970s, a wave of young artists migrated from suburban zones surrounding the city to what was then an affordable neighborhood: Manhattan’s Lower East Side. Within this cluster of neighborhoods then among the most ethnically and culturally diverse in the city, the prospect of unifying art and activist politics would be raised once again. As early as 1977 New York’s “alternative” art scene including Artists Space and Grand Street had generated their own alternatives. One of these was Collaborative Projects inc. or COLAB. Strongly influenced by the Lower East Side’s Punk music scene, COLAB’s eclectic programming included experimental cinema and video, performance art and massive thematic group exhibitions with titles like The Manifesto Show, the Doctors and Dentists Show and the Dog Show. 11COLAB’s success was soon matched by other similar ventures. Perhaps the best known of these, Fashion Mode, was an artist and community center located in the Bronx. COLAB’s exhibition procedure was ingenious. Group members first located a cheap industrial space after which members were [then] invited to produce art based on [an] the exhibition’s theme[s]. Work Delivered to the space [work] was hung on a first come, first serve basis. Silk-screened street posters and word of mouth advertised. these thematic salons The exhibitions themselves resembled a patchwork quilt in which drawings and paintings, kitsch, and graffiti covered walls from floor to ceiling. Signaling an overt rejection of SoHo’s orderly consignment of art products in neat white galleries, COLAB’s visual congestion also announced the tumultuous arrival of a legion of new art practitioners ready to test the ramparts of the New York art establishment. The style of work favored by COLAB — figurative and self-consciously crude by SoHo standards— was itself a rebuff aimed at the prevailing formalist aesthetic of the art industry. It also called for the encouragement of “human fantasy that lives in all people.” 12Alan Moore and Marc Miller, "The ABC’s of No Rio and its Times" ABC No Rio Dinero: The Story of a Lower East Side Art Gallery, ed. Moore and Miller ( USA: Copyright 1985, ABC No Rio). The authors of the unsigned manifesto (it was in fact written by Alan Moore) dedicated The Real Estate Show to Elizabeth Mangum, a “middle aged Black American killed by police and city marshals as she resisted eviction in Flatbush [Brooklyn, NY] last year” and insisted that artists “express solidarity with Third World and oppressed people.” The text also emphasized “it is important to have fun.” while proclaiming a desire for independence not only from commercial interests such as those in SoHo, but also from state financed alternative art spaces. The Real Estate manifesto went on to call for artists to work “on a boulevard level,” to reach working people and the non-art public, and to address the negative impact that artists were having on the Lower East Side. Despite the fantastic mix of Maoist and Situationist language, the text effectively hit on three of the principle desires and contradictions that would haunt this budding new East Village bohemian Left. Each of these objectives —from the aim of establishing a genuinely alternative exhibition network, to the romance of “the street” as distribution site, to the “identification with the ʻother” —would be taken up by the new activist culture and each in turn would evade satisfactory resolution. Although the Lower East Side was the medium in which this new political art activism was cultured, local issues did not entirely dominate the scene. With the United States defeat in Southeast Asia and the Watergate affair as backdrop, international political and military humiliation for the United States was coming in waves. By the summer two US-backed regimes, one in Nicaragua and one in Iran, had been defeated by popular insurrections and a major insurgency was immanent in the US client state of El Salvador. 1979 was also the year of the near melt-down at the Three Mile Island nuclear power plant and the settling of a ten million dollar lawsuit against the Kerr-McGee Nuclear Power Corporation brought by the family of a suspiciously irradiated industry whistle blower named Karen Silkwood. In November the US embassy in Tehran was stormed by Islamic students, its staff taken hostage. One month later Robert Mugabe declared victory over the white Rhodesian government after a protracted military campaign. Before the year was out the Soviets had invaded Afghanistan and Chinese officials taken down the Democracy Wall in Beijing. Within a year an independent trade union was recognized in Poland, Ronald Reagan and his conservative republican coalition seized the white house and three US nuns were found raped and murdered in a ditch in El Salvador precipitating mass opposition to Reagan’s involvement in Central America among activists and artists. 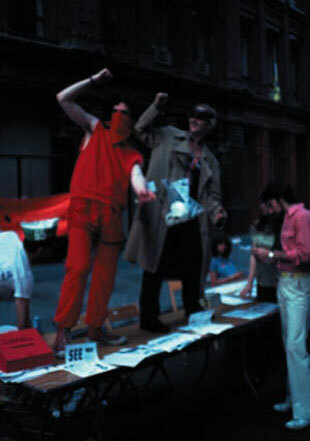 Members of Group Material perform at an event co-developed with PAD/D and several progressive labor unions in NYC entitled No More Witch Hunts and organized to protest Ronald Regan’s anti-terrorist public surveillance legislation in 1981. The Left, including the new, the old, and the Green, mobilized around these issues. One artist’s group emerged which defined their mission as building a bridge between the organized Left and artists. Its objective was to produce a truly alternative and oppositional cultural sphere. The group, Political Art Documentation and Distribution or PAD/D was founded in early 1980. 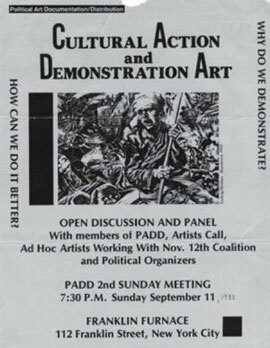 With more than 20 initial members the accumulated political experience of PAD/D reached as far back as the mid 1960s and ranged from recent art school graduates to those who had been active with organizations such as Heresies, Art Workers Coalition (AWC), The Anti-Imperialist Cultural Union, Artists Meeting for Social Change (AMCC), and even Fluxus. PAD/D’s original agenda was so extensive that it resembled the platform of a bona fide political party which in many respects it was modeled upon. Indeed PAD/D’s immediate ideological foundation was built in part upon a short-lived artists collective that published a journal entitled Red Herring. Red Herring[ʻs] sought to develop a “proletarian culture” specific to North America. Its theory, influenced by China’s Cultural Revolution, called on artists to “learn from the masses.” and reject the artworld. 13Red Herring. (two issues: New York: January 1977 & ?) What remained of the New Left at the end of the 1970’s interpreted the severely depressed international economy and the stumbling U.S. military regime in Latin America, Southeast Asia, and Iran as a sign that United States imperialism and perhaps capitalism itself was near to collapse. The job of the Left therefore was to provide leadership in the transition to socialism. The job of the cultural worker was to rally other artists to support this project. Though it never became an official party line, this analysis was operative within PAD/D most strongly in its first two years. However the selflessness and discipline required to carry out such a program soon clashed with individual members artistic and career-based needs. Above all else it was this attempt to forge a viable network of politically sympathetic exhibition outlets for activist art that set it apart from other collectives either before or since. Before political art went mainstream some five or six years later, art with social content was still being ghettoized as “Angry Art” or “Protest Art” and self help was the order of the day. The projected network of artists and outlets PAD/ D anticipated was to involve the orchestration of community centers, university galleries, union halls, and even church ministries (recall that the early eighties coincided with North American Leftists discovery of “Liberation Theology”) — in sum a completely alternative system of distributing politically committed projects to an audience of progressive activists, many of whom were unaccustomed to this level of social engagement on the part of artists. At the end of its first year however PAD/D developed an internal fracture between the stated aim of serving other progressive artists on one hand and a growing desire by a majority of members to initiate group art projects on the other. By the end of 1982 the group had participated in two art exhibitions and four public art events including a mass march to Washington and the self-initiated multi- sited project called Death and Taxes which took the form of an open invitation to artists for public work protesting the use of federal taxes for the military. Simultaneously presented at different public locations on April 4th, Death and Taxes included a thirty by twenty foot anti-Pentagon slide projection on the wall of the 26th street armory in Manhattan and the appropriation of one thousand personal income tax forms that were then over-printed with anti- war graphics and re-circulated so that New Yorkers would discover them at random during tax season. PAD/D remained in existence for almost eight years yet it’s initial presence as a focal point for New York’s activist art went into declined around 1985 when a prudent version of “political art” become institutionally viable within the art world. 15Art with political content was the industry fashion from about 1985 to roughly 1992 including two key exhibitions one at the Museum of Modern Art entitled Committed To Print and the Whitney Biennial of 1993. 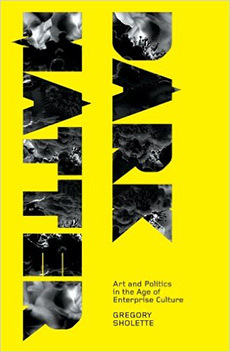 For a debate about the relationship of political art to the art industry see my essay "Waking Up To Smell The Coffee Reflections on Art Theory and Activism" in Re-imaging America, ed. Mark O’Brien and Craig Little, (Philadelphia: New Society Publishers, 1990): 25-33. By 1988 all that remained of the groups initial agenda was its archives of political art today housed at the Museum of Modern Art. An important source of information about activist culture, the diversity of PAD/Ds archive once again reflects the catholicity of the groups concept of counter-culture that includes documentation of performance art, guerrilla actions, street posters, gallery based political art, and even plans for an international art strike in 1969. But the predominance of material dating from 1980 to 1990 evinces the dynamic expansion of activist art during these “red” years. 16The MoMA Library makes the PAD/D Archives accessible to artists and scholars by appointment. Group Material on East 13th Street in 1980-81. Growing out of this concept of an expanded art audience, the storefront became a combination group headquarters and activity center for neighbors and school kids. Stating that “an independent art depends on its not being a business” Group Material’s hours were 5 P.M. to 10 P.M. and “ oriented toward people who must work.” In the first year group members screened films and offered children’s art classes. They also managed to bang-out a series of eight exhibitions with titles like: “Alienation”, “The Gender Show”, “Consumption: Metaphor, Pastime, Necessity,” and “Facere/Fascis” a prophetic critique of fashion culture. However, by group members own accounts the most important of these early exhibitions was “The People’s Choice” (later changed to “Aroz con Mango”). Instead of work made by artists Group Material displayed “beautiful objects” from the homes of people in the immediate Latino community. Re- working the thematic formula developed by COLAB into a form of ethnographic self-representation, “The People’s Choice” consisted of china dolls, family photographs, posters, and even a neighbor’s Pez candy dispenser collection. all chosen by the neighborhood residents themselves 18The objects selected for "The Peoples Choice" were solicited from residents of East 13th Street in a letter from Group Material that requested locals to bring to the gallery "... the things that you personally find beautiful, the objects that you keep for your own pleasure....something that you feel will communicate to others....." A letter from Group Material to local residents dated Dec. 22 1980 quoted in Jan Avgikos "Group Material Timeline: Activism as a Work of Art," But is it Art? Nina Felshin ed. (Seattle: Bay Press, 1995) 85-116. Group Material conceived of this work not only as a way of making their art space less off-putting to their primarily Puerto Rican neighbors, but they also aimed to send a message to the art establishment about its own exclusionary cultural practices. Yet the exhibit can also be seen in anther way; as a polemic against the predominant aesthetic ideology of the Left . Since the 1920s, activist political art stressed the deployment of high-art techniques into community settings (read: other peoples cultures) in order to illustrate political lessons and facilitate self-expression. This approach is exemplified by certain practitioners of the mural art movement. Setting aside for now the different sort of patronage presented by Group Material in which a group of University trained artists notarized other peoples belongings as “art”, what now seems most significant about “The People’s Choice” is the way it can be viewed as part of a shift in museum practice. . While certainly not the intent of Group Material, “The People’s Choice” nonetheless points to a transformation within the ideology of the art world in which the idea of the museum as a privileged, discerning authority that masquerades as public education is inverted to one where political and economic interests of a global nature appear as dynamic cultural advocates, a point I will come back to later. What did Group Material accomplish with “The People’s Choice” and other similar exhibitions in their gallery? These projects offered viewers a visual, textual and tactile symbol of what an ideal cultural democracy might look like if one were to emerge. This enactment or performance of artistic democracy remains the enduring feature of Group Material’s work through curated installations, public art projects and forums. In 1985, after producing several innovative public art works including one in the New York City subway system, Group Material was invited to participate in the Whitney Biennial. The project they assembled entitled “Americana” combined contemporary art, mass produced products, images excerpted from mass media, and historical documentation. As always the collective stressed cultural inclusion. Nevertheless Group Material’s previous circumvention of what they once termed the “bright, white rooms and full-color repros in the art world glossies.” 19Group Material. 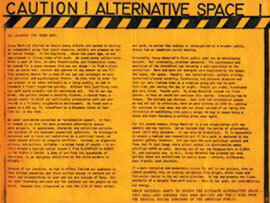 Caution Alternative Space! (offset flyer, not dated.) had come to a close. While the focus on cultural diversity remained, future projects over the next eleven years would be carried out primarily within a framework provided to Group Material by the art world. Group Material completed its last major project in 1979 as a response to an invitation by The Three Rivers Arts Festival in Pittsburgh Pennsylvania. The collective (at this point consisting of two remaining members) publicly debated the growing phenomena of municipally sponsored “community-based” public art. Choosing to use the very brochure that the city of Pittsburgh distributed to advertise its month long festival, Group Material inserted into this publication what the collective described as a “constructed dialogue” of “… unarticulated perspectives and voices…” in order to construct a picture of “community” and “the city” as indeterminate and contested.” 20Three Rivers Arts Festival. Program brochure. (Pittsburgh Pa. June 7-23, 1996). By interjecting into the festival brochure a series of unsigned quotations culled from architects, designers, critics, and people interviewed at random on the streets of Pittsburgh Group Material was able to suggest that public space in Pittsburgh (like many other municipalities) is a conflicted terrain. “Pittsburgh is like a big fort….” someone remarks while another states “Downtown never was a social space.” and to underscore Group Material’s own agenda the anonymous statement: “Many officials are using the vocabulary of community. This kind of thing reminds me of Pat Buchanan quoting Martin Luther King.” 21Three Rivers Arts Festival. Ultimately the argument made is that the economic interests behind the privatizing of public space are eager to use this new form of “Community-based art” as a symbol of inclusiveness and democracy, while avoiding the expense of supporting egalitarianism in actual practice. 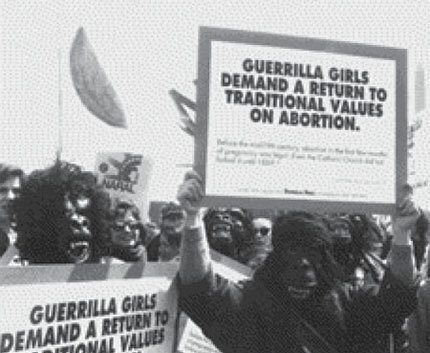 Members of the Guerrilla Girls marching in costume circa 1992. The dissolution of PAD/D and Group Material brings to official close what had been obvious for many years; the legacy of political art activism that started in the Lower East Side of New York between 1979 and 1982 was no longer sustainable in practice. Caught between the desire to build a progressive alternative to mainstream U.S. culture and the attempt to re-kindle the exhibition strategies of a once radical avant-garde, the fading of New York’s “new wave” of activist art was nothing less than ironic. On the one hand PAD/D had not survived the demise of an ever more factionalized Left with which, in hindsight, the group had too closely identified itself, and on the other hand Group Material’s accommodation by the art world ultimately lead the collective in its last project to sardonically debate the very practices that it (along with PAD/D among others) had once fought to establish. These include the opening up of the art establishment to culturally diverse forms of artistic expression and the development of models for community based public art projects. While other forms of collective art activism did emerge in the later half of the eighties, most notably Gran Fury and the Guerrilla Girls, unlike PAD/D or Group Material these new collectives focused their political agenda on specific issues including opposition to racial and gender based discrimination by museums and galleries, and the culpability of the medical and political establishment in the spread of the HIV virus. The work of Gran Fury and the Guerrilla Girls re- worked many of the activist concepts first tried in the early eighties, substituting for low cost street flyers and stencils expensive commercial advertising. techniques. By directly appealing to the aesthetic of mainstream pop culture both groups aimed to “de- ghettoize” activist art. Yet this bold tactic also coincided with the fading of critical tension between high and low art and the disappearance of a perceivable public arena of cultural dissent.. Within this new global topography of information, art and entertainment even the look and language of dissent becomes source material for graphic imaging, public spectacles and fashion. in which the semblance of opposition is folded into a mainstream spectacle It is no accident therefore that what is absent from activist culture today is the very idea of an oppositional public sphere. Gone is any desire to establish a non-artworld network of exhibition outlets bringing together progressive art, media activists, and Left intellectuals once an explicit goal of PAD/D. Today the question is not which “transgressive” artistic strategy might work against a system that actively mimics its opponents, but how to re-frame a critical art practice once again within a larger political and social agenda. Understanding the implications and legacy of political activism is one means of initiating this critical repossession. One art world phenomenon that cannot be understood outside the history of art activism is the practice known as site-specific art. This concept, whereby the physical and/or social context of a particular location grounds the production and reception of the work[,] is claimed by two very different groups of contemporary artists. Both factions of site-specific art practitioners trace their thinking to the architecturally grounded site works of conceptual artists such as Michael Asher, Robert Smithson, or Daniel Buren in the late 1960s, but one group continues to pursue the art world as the privileged specific site of intervention, while the other presides over what remains of a public sphere. It is difficult today to understand how the former use of site-speci- ficity can still seem radical, yet a new generation of artists continues to treat the gallery and museum as if it were still open to interrogation, as if de-concealing the institutional frame might yield different results if carried out just one more time. 22The most recent group of artists to take up this tactic is Parasite. Soon after announcing its formation in 1997 the group was offered headquarters at several well known alternative spaces in New York City thus begging the question which of these two entities -- the institution or the collective-- is the site and which the supplemental appendage. Like a stock plot out of an episode of the X-Files our artist investigators comb the museum’s crime scene. Although already scoured by other cultural forensicologists they discover an overlooked clue! Unlike television however the art world evidence turns out to be planted in the classic style of dis-information. Still our investigators obligingly re-discover the obvious. Such repetition is predictable for the TV re-run generation as site-specificity is revised strictly as a matter of formal innovation. The other site specific art being produced and discussed in the nineties expands upon the reading of site as context: social, political, and only in the last instance formal. Despite the label “New Genre Public Art” 23See Suzanne Lacy’s remarks in Mapping the Terrain: New Genre Public Art, Suzanne Lacy ed. Seattle: Bay Press, 1995. this work is effectively a rehabilitated form of civic art, only instead of disguising issues of racial intolerance or historical injustice through public monuments, this new site-specific practice attempts to bring the very idea difference itself into focus as public dialogue or spectacle. One of these practitioners of contextual site-specific art is REPOhistory, a New York based collective of artists and writers founded in part by former members of PAD/D, myself among them. Founded in 1989, REPOhistory echoes some of the ambitions of PAD/D and Group Material by facilitating alliances between artists and non-artists. In each of its public projects to date, artist-designed street signage is installed on city streets in order to: “retrieve and relocate absent or overlooked historical narratives at specific sites…” 24REPOhistory, The Lower Manhattan Sign Project, catalog (New York: The Lower Manhattan Cultural Council, 1995). Some of the histories the group has temporarily “repossessed” include: the location of the City’s first slave market; the offices of Madame Restell, New York’s most successful 19th Century abortionist; the shape of the island’s pre-Columbian coast line; an historic visit by Nelson Mandela; an alleged 1741 slave rebellion in Dutch controlled New Amsterdam; the stock market crash of 1929; and the draft-dodging and gold speculation of J. P. Morgan during the Civil War. 25Gregory Sholette, letter and three-page proposal to Lisa Knauer, April 11, 1989. 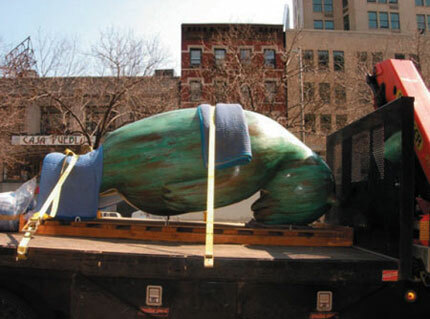 Tom Otterness sculpture being dismantled on Manhattan’s Upper West Side in 2005, once a member of COLAB along with Kiki Smith, Jenny Holzer, and John and Charlie Ahearn among many others the popular artist’s work is now found throughout the city and around the US in playgrounds, hotels and public parks. Similar street-sign projects have commemorated legal activism, incidents of gay and lesbian history in New York’s Greenwich Village and in downtown Atlanta Georgia signs were used to demarcate a now vanished African-American neighborhood. The specifically situated information generated by these projects is expanded upon via local and national news media, as well as through the distribution of free maps and public walking tours. Still REPOhistory’s attempt to cross a number of disciplinary boundaries has proven less effortless. The group has collaborated with historians, urban geographers, legal activists, unions, and architects nevertheless an extended dialogue between these various fields and the artists has not taken root. While this may be due to the discursive and economic interests that define the jurisdiction of each discipline it is most likely the absence of a Left public intelligentsia and a civic forum in which critical, non- academic dialogue can be secured that has contrubuted to this impasse. Not only is the vestige of 80s activist art visible within REPOhistory, but so is a certain idealized concept of the urban street, one that envisions these “boulevards” as an edge space where a suppressed, but potentially militant historical opposition lies withdrawn and secretly available to the activist artist. Take away this quixotic contingency and REPOhistory’s public projects serve either as a model for collective practice at a time of intense art careerism, or as a curious hybrid of historical tourism, graphic design, and political didacticism aimed at message saturated pedestrians. However, it may be the unapologetic utopianism of this work (and the art-worlds lack of interest in it thus far) that signals an occasion for tempered optimism. With the radical potential of the information “highway” dimming fast, both cyber-activists and street-savvy public artists might consider developing a new theory of radical enthusiasm. 26What may be required to combat the affectless simulation of activist culture is a counter strategy that embraces the idea or myth of a resistant collective will proposed by Gramsci. After all, if right-wing public intellectuals can pilfer revolutionary desire why can’t the Left re-appropriate these in turn? It was not all that long ago that the marketing and display of high culture was organized around the maintenance of an implicit ruling- class ideology one that art historian Carol Duncan ironically described as “dedicated to the spiritual enhancement of all who visit there.” 27Carol Duncan, "The MoMA’s Hot Mamas," Aesthetics of Power: Essays in Critical Art History. (Cambridge: University Press, 1993) 189-207. Today however, the culture industry and museums in particular have begun to withdraw this offer of communal access to spiritual enhancement. In its place comes visual and cultural vicissitude, the spectacle of democracy as global emporium. Museums and galleries remain public showcases but virtually no-thing is permitted to escape the privilege of being represented as art. That which has not yet appeared within them one of these cultural spaces is just months or weeks away from doing so as everything that can be described, displayed, fabricated, performed, or photographed including images of molecules, dissected pigs, acts of coitus, vats of industrial liquid, bad jokes, surgical prostheses and arrangements of mail-order merchandise finds a willing curator with an available exhibition space. If 60’s Pop Artists borrowed and then re-worked cultural detritus: comic books, plastic junk and soup cans, occasionally with a socially critical edge, the new pop or “low pop” artist simply displays such things in toto. 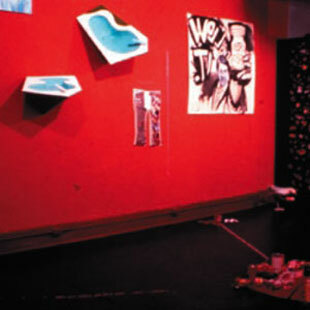 An installation may consist of assorted kitsch, advertisements, film stills, computer images, and consumer products, yet the artist leaves it to the viewer to reflect on their status. This casual use of mass culture follows logically from the disappearance of any significant difference between images or objects in a museum and images or objects produced for mass consumption. For example a recent installation by artist Jason Rhoades consists of assorted lawn equipment, electrical generators, quartz lamps, unspecified furniture and a donut making machine piled onto a large shag rug. Although the title of the work is “My Brother/Brancusi,” Rhoades’s high art reference to the Romanian sculptor amounts to a column of stale donuts lanced upon an upright steel rod. Neither is Rhodes’ accumulation of odd contraptions intended as a social commentary about cultural anomie (too 70s) nor is it a post-modernist burlesque critiquing its own commodity status (too 80s). In Rhodes work, as well as that of many of his contemporaries, the lumping together of commercially manufactured “stuff” that might have been ordered from a Sears catalog (by the artist or by his brother for that matter,) begins and ends with political, vocational as well as aesthetic indifference. “Low-pop” and what might be called its complimentary “tech-pop” is boastfully meaningless. This new expanse of undifferentiated high and low culture extends beyond the borders of the art world. Witness such recent mergers between the mainstream and the peripheral as garage band clothing, Hollywood movies made by post-modern artists, collaborations between “serious” architects and the Walt Disney corporation, or the candidly displayed heroin addiction of supermodels and pop stars. Meanwhile a shaken commercial gallery system has benefited from a new breed of curator. Evolving out of the post-wall street crash environment of the late 1980s curators approach thematic exhibitions as a form of art practice. The technique, pilfered from the likes of COLAB and Group Material but stripped of any political agenda, often reduces the artist to an element of curatorial imagination. As galleries have loosened their financial commitment toward the traditional stable of artists, thematic exhibitions help compress production and consumption into a single locus: the commercial space itself. Similar trends are emerging within contemporary art museums. Even installation art, work that typically exists only for the duration of an exhibition, can be understood as an outgrowth of a downsized art industry. The artist for her part, politically self-impoverished and economically beaten down, is left to compete for access to the niche markets of an increasingly service oriented and ever more global art industry. 28For an insightful look at this issue by several practicing artists see: "What’s Intangible, Transitory, Mediating, Participatory, and Rendered in the Public Sphere by Andrea Fraser and "Services: Working-Group Discussions" that follows Fraser’s piece in the October #80, Spring 1997. Taken as a whole, this no-holds barred new art world order reverses the old ideology of institutional neutrality. 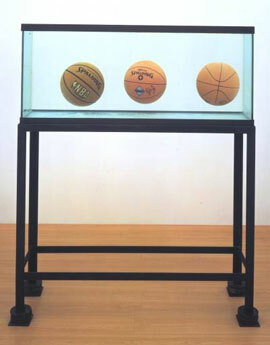 If once artists such as Acconci, Kaprow, Haacke and Rosler forced an increasingly problematic range of acts, systems, and things, through the incision made by Duchamp in the museum’s protective skin —things that the museum had worked very hard to prohibit— the new culture industry is outright predatory. It now summons every conceivable object, act, subculture, high culture, friend or foe, like an InterNet search-engine, forcing all to appear, to be questioned, to reveal their hidden aesthetic identity. Impinging on all other spheres of production and not unlike the modern legal system, it advertises its own positivity while assuring all concerned — from producers to dealers, from curators to consumers— that anything can be made to bear witness to the goodness of diversity. Perhaps the best response to this new and erratic terrain involves putting less faith in the intrinsic transformative or transgressive potential of art and instead treating visual culture as one component of other social undertakings including political activism, public education and the battle over access to public space itself. Nevertheless within the present landscape the art activist, reduced to practicing a residual cultural form, perhaps even a nostalgic one for the moment, bides her time while putting faith in the unpredictable contingency known as history.